The Enneagram is a spiritual and psychological system that has been used since ancient times in the Middle East and Asia. It’s a model of human personality, which is mainly understood and taught as a typology of 9 interconnected personality types. It uses the Enneagram diagram to determine which personality type we have, based on our underlying traits and characteristics. Understanding which Enneagram type we fall into, can help us become consciously aware of our personality- such as which patterns we repeat and what our triggers are. Here’s the basic theory behind the Enneagram: when we were children who were just beginning to explore the world we found it safer to identify with a singular personality type. As we get older and gain more confidence and flexibility, we begin to balance our personality through encompassing other traits and characteristics. 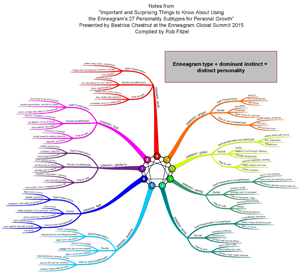 Discovering which Enneagram personality type we belong to is helpful for many reasons. One of them is, it gives us thorough insight into our patterns of behavior that influence our personal lives, our relationships and our profession lives as well. To achieve results that are a direct reflection of us now, not who we see ourselves as or who we used to be, we need to get our ego out of the way. Then we can observe ourselves with clarity and make any changes that are needed so we can work on developing the traits we desire and wish to possess. The shorter test is here. The longer test is here. These tests can tell us which of the 9 Enneagram types we identify with most strongly. Each of the 9 Enneagram types are identified with a number from 1-9. Reformers are idealistic individuals. They are advocates for change and are always seeking to improve, repair and perfect things to achieve what they think is the highest level of standards. Traits: Ambitious, conscientious, dedicated, discerning, idealistic, independent, intelligent, high morals and values, noble, principled, perfectionist, problem-solver, purposeful, rational, realistic, self-controlled, wise. For a thorough description, click here. The Helper is a heart-based type whose main focus is on sincerity- both in friendships and relationships. Traits: Altruistic, caring, demonstrative, emotional, generous, high expectations, interpersonal, irrational, loving, nurturers, people-pleasing, possessive, practical, selfless, sensitive, sentimental. For a thorough description, click here. Performers are the achievers of the group. They set goals and expectations for themselves and believe that only when they meet them, will they gain affection, approval and validation from those around them. Traits: Adaptable, achievers, ambitious, attention seeker, charismatic, driven, energetic, excelling, fast learners, hard workers, image conscious, pragmatic, self-confident, successful, vain. For a thorough description, click here. Artists see themselves as being unique from everyone around them. They are often highly-skilled and talented in several areas of artistry. They express themselves through their creativity- for them, this is a main focus in their lives. Traits: Artistic, creative, empathetic, expressive, dramatic, feeling unworthy, imaginative, individualists, introverts, intuitive, perceptive, self-absorbed, sensitive, temperamental, unique, withdrawn. For a thorough description, click here. Thinkers can see the world from several perspectives. They are visionaries and philosophers who show the world a new way of looking at things. They have an insatiable curiosity and are always asking questions in order to get a new and unique understanding of how the world, and everything in it (and beyond), works. Traits: Alert, analytical, calm, cerebral, curious, devoted, independent, innovative, insightful, intense, investigator, isolated, minimalist, objective, perceptive, secretive, thinkers, withdrawn. For a thorough description, click here. They are loyal to everyone and everything- their friends, family and their morals. There’s nothing a loyalist won’t do to support what they believe in. This is mostly due to their fear of abandonment. This fear ensures their attachment to everything around them so that they have something to grasp on to. Traits: Appealing, anxious, assertive, committed, compassionate, compliant, dependable, faithful fearful, hardworking, intelligent, loyal, obedient, outspoken, reactive, responsible, security-orientated, suspicious, trustworthy, worrier. For a thorough description, click here. The Visionary is an enthusiast, because they see through the eyes of adventure. They have a fascination with the world, and see it as one giant playground waiting to be explored. Traits: Adventurous, acquisitive, busy, creative, distractible, dreamer, energetic, enthusiastic, entrepreneurs, extroverted, fun-loving, free-spirited, lively, optimistic, playful, scattered, spontaneous, versatile. For a thorough description, click here. Challengers are straight-talkers, and they can come across a bit brazen or bold. They are sometimes blunt, abrasive and aggressive. Without knowing it, they are confrontational and intimidating when trying to make their point. Traits: Aggressive, assertive, blunt, confrontational, courageous, decisive, demanding, direct, dominating, independent, powerful, protective, self-confident, straightforward, strong willed. For a thorough description, click here. Harmonisers are the peacemakers. They work to maintain both inward, and external peace. Traits: Accepting, agreeable, approachable, calm, creative, easygoing, optimistic, peaceful, non-judgmental, likeable, reassuring, receptive, resigned, supportive, tolerant, trusting, unassuming. For a thorough description, click here. The symbol of the Enneagram includes a circle (representing 0) and 9 lines. As our life changes around and through us, we move around the circle- showing emotions and behaviors relating to the various types. Although, it is thought that we remain dominant within our original personality type. The Enneagram is simply a map of the energy and flow of life. We move between the lines and dance around the circle, depending on the universal ebb and flow.